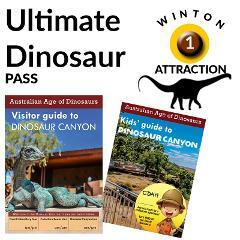 ULTIMATE DINOSAUR PASS: Includes guided tour of the Australian Age of Dinosaurs Museum: Fossil Preparation Laboratory, Collection Room and Dinosaur Canyon. Timing: 3 hours. 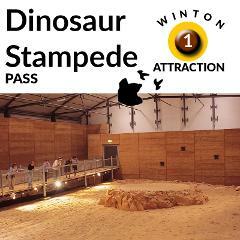 DINOSAUR STAMPEDE PASS: Includes guided tour of Dinosaur Stampede National Monument at Lark Quarry Conservation Park (110km south-west of Winton). Timing: 45 minutes. 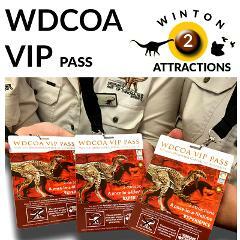 WDCOA VIP PASS: Includes guided tour of the Australian Age of Dinosaurs Museum AND Dinosaur Stampede National Monument at Lark Quarry Conservation Park. Timing: 3 hours 45 minutes. 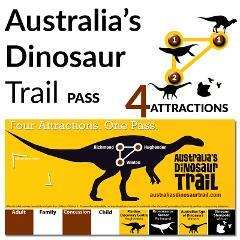 Australia's Dinosaur Trail Pass: Includes a guided tour of the Australian Age of Dinosaurs Museum and Dinosaur Stampede National Monument in Winton and entry to Kronosaurus Korner in Richmond and Flinders Discovery Centre in Hughenden.